Funny. Touching. And now a Christmas TV special. David Walliams has a message for you: dare to follow your dreams. Dennis lives in a boring street in a boring town. He doesn’t have much to look forward to. But what he does have is dreams. They’re more colourful than a rainbow, wilder than a zoo, and topsy-turvier than a rollercoaster. And once he starts to follow them, things will never be the same again. You’ll laugh… you’ll cry… and once you meet Dennis, he’ll live with you forever. No need for gloves and mittens this winter. Read this and feel toasty inside. Can you complete The Boy in the Dress crossword? 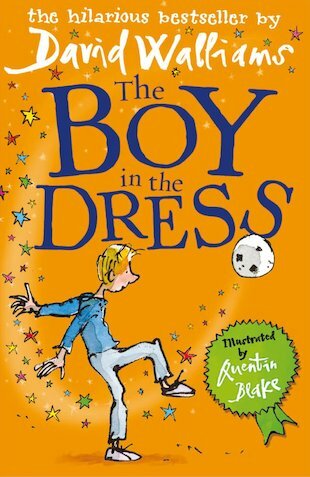 The boy in the dress is about a boy who wears a dress to shool and a wig. He was acting out a new girl .if you have not read it then finish the other book you are reading and when you have finished start reading boy in the dress. I think this book is a really down to earth story and i really like the idea.This is an hilarious book in my opinion.It will knoch your socks of! I think this book is amazing because it is so funny. I think all boys can wear dresses.LOL!!! This is really nice book and it is by David William so I like it more because David William is favourite author.